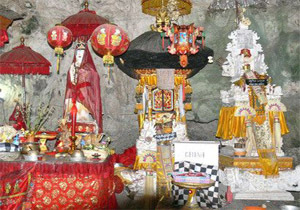 There are a lot of holy caves in Bali and normally stated as ritual place for certain ceremony and some famous cave is also treated as a very important temple such as Goa Gajah and Goa Lawah (Goa means Cave) and one of those is the temple of Goa Giri Putri in Suana village, Nusa Penida Island, Klungkung Regency. This Giri Putri Temple will give you a different experience that is rarely found in other tourism area in Bali. The history of this temple is said to be predicted in Neolithic era. In this era, it was said that human lived without feeling, norms, or even rules. They always lives as a wolf to other human, who is stronger, he will survive this world. To save lives and developing families, this cave is said to be used for protection. And later when the world is getting better, this temple then used for meditation and spiritual purposes. The word “Giri Putri” was given to the greatest cave in Nusa PenidaIsland by certain reason. The word “giri” means ’hill’ and the word “putri” means ‘female”. Those words were given to refer the cave as holy site of Siva on the manifestation as a goddess whose possess the nature to protect, nurture, and loving human being. About geographical data provided by Warmadewa University in 2007, this cave is approximately 262 meter in length and located on 150 meter above sea level. Inside the cave there is water path, stalagmites, stalactite, bats, and snakes. 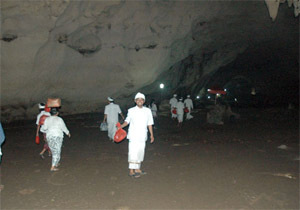 There are four biggest main area of this cave that is used as main praying area. One is placed in front of the cave and the other three is inside the cave. Before 1990, this cave is only used as local tourism spot (mainly on Galungan & Kuningan). And the water inside the cave is used as holy water for ceremonial purposes. One unique fact of this cave is that the main entrance to this cave is so small. The entrance is only a size of a bucket. Even one adult seems unable to get inside. However, it just looks that way. When you tried to get inside, you will get there without big trouble. Moreover, people usually surprised when get inside the cave to see the big and wide area inside the cave that can fit to approximately 5.000 people. This temple also has a very strong relationship with two other big temples. When a big ritual ceremony is due on the tenth full moon (based on Balinese traditional calendar) every year, the ceremony is also related to the Puncak Mundi Temple and Dalem Ped Temple. Therefore, when people are visiting Nusa Penida Island for ritual purposes, those three temples will be the main destinations. However, people are more eager to sleep over in Dalem Ped temple since the weather is warmer and the facilities are provided more.The condition of this cave is far different compared to its condition in 1990. In the past, this cave is more likely to be dark, cold, and scary. However, now the cave looks brighter and well preserved. I Nyoman Dunia as the head village and the priest of Giri Putri Temple said that there are 13 temples (palinggih) in various forms of architecture. If you are eager to pray in this temple, the first area will be the Tri Purusa Temple located in outside the cave. After praying in the Tri Purusa temple, the next area will be entering the cave. This cave is divided into three main praying spot: in the front, middle, and backside. In this area there are four temples as a place to pray for safety and prosperity for life. Advanced into the middle part of the cave, there are five temples, three in the bottom and two other are above. This holy place is a place to pray for spiritual pureness. This is a place to pray to be freed from all negative things. The outer side of this middle part is a meditation place. Balinese believe that people can be cured in this holy place. The meditation spot is also well naturally decorated by stalagmite and multi-color cave wall. With beautiful sounds of dropping water, this place is a perfect place for meditation. The west end of the cave contains four temples. In this place people can see a beautiful panorama where the sunlight coming inside the cave. And there is also an exit route in this area where people also can see the beautiful nature of Nusa Penida Island. If you are visiting Nusa Penida Island, don’t forget to come to the temple of Giri Putri. A unique experience travelling in Bali is treasured here.